One of the general criticisms about standards is that they are almost always out of date - those leading technical innovation are usually guessing where things are going and hoping they make the right bet. Given the increasing awareness and focus on sustainability and on minimizing the overall environmental impact of products across their entire life cycle, is there a useful role for standards? Electrical and Electronic Products and Systems (IEC 62430) would answer, "absolutely!" The new standard, which was released in draft form for final review March 21st (the review period ends September 5th) was initiated by the delegation from Japan, but developed with the participation of technical experts from 26 additional countries. 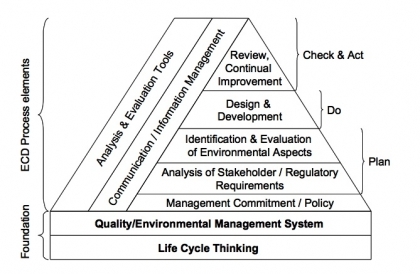 The standard also goes on to define how an "Environmentally Conscious Design Process (ECD Process)" can be implemented, including processes, supporting data requirements, and the role of systems for analysis/evaluation and control, across all life cycle phases. Figure A.1 from the draft standard provides a great graphical overview of the elements and inter-relations that make up the ECD process. environmental performance over subsequent product generations, and potentially to provide comparison to competitive products. I believe that this draft standard has real value and is definitely worth evaluating. Unlike some technical standards that are always behind (e.g. IEEE 802.11- how many of you have bought a "draft n" device? ), IEC 62430 defines a very useful framework for sustainable product development. In my judgment, it has the potential to foster standard practices for life cycle assessments that will allow end users to make informed purchase decisions. Ultimately, that rewards the producers who are working to make a real difference in sustainability. Further, I believe that the methodology and framework are applicable and of value to other industry verticals beyond the electronics industry.